Mr. Cody Baugh went to The University of Tusculum. He has a degree in Physical Education. 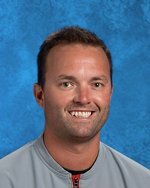 Mr. Baugh is head football coach at Cherokee, and started in 2016. He also played football at Tusculum and Greeneville. Mr. Baugh has a wife and three children, 1 son and 2 daughters.